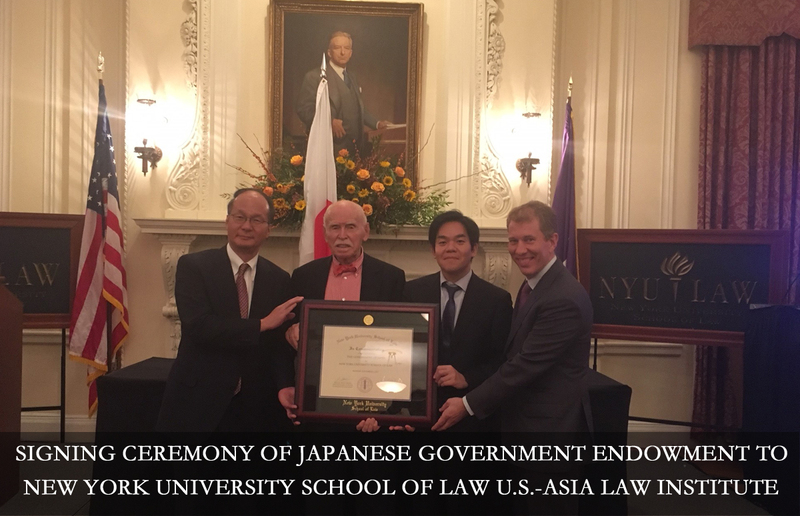 The Government of Japan has endowed New York University School of Law U.S.-Asia Law Institute (USALI) with $5 million, recognized with a signing ceremony which took place on Monday, November 6th. This was held at the NYU School of Law, following USALI’s all-day 23rd Annual Timothy A. Gelatt Memorial Dialogue on the Rule of Law in East Asia. This grant was given to USALI in recognition of its internationally esteemed excellence in the legal study of Asia and in discussions on policy matters in the East Asian region. The Institute will utilize the endowment by advancing the study and discussion of Japan’s role in international relations and security from an international legal perspective. It will also help fund the search for its next Director who will broaden USALI’s studies of existing legal frameworks and explore possibilities for peaceful, legal resolutions in the Asian region on legal systems in Asia. USALI, the U.S.-Asia Law Institute, of NYU School of Law seeks to promote the rule of law in Asia, including both domestic and international law. It works to improve popular, professional and scholarly understanding at home and abroad through its publications and exchanges concerning comparative and international law.